This company played an important, and at this point, somewhat mysterious role in the early days of the Dolphin. Bob Larson, one of George O'Day's original investors in G. D. O'Day Associates Inc. (later the O'Day Corporation), was one of the owners of US Yachts along with Warren Dellenbach and others. The company referred to itself as an affiliate of O'Day but the exact corporate relationship between the companies is not clear. Your webmaster has spoken with Bob several times and he was very helpful in the effort to better understand the early days of the Dolphin. 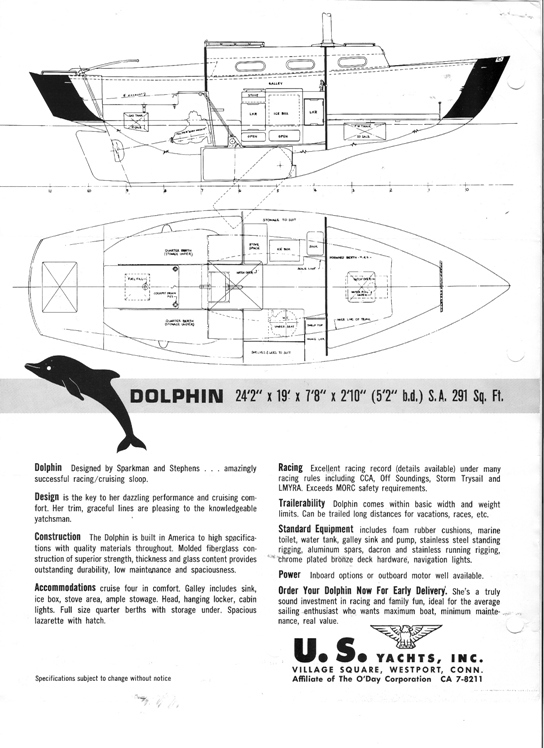 In early 1960 the Dolphin 24 was introduced and initially marketed and sold by G. D. O'Day Associates, Inc. Starting up the Marscot Plastics plant in Fair Haven, MA, not only with the Dolphin but with a number of O'Day small sailboats including the popular Uffa Fox designed Daysailor, put a major strain on the plant and the organization. 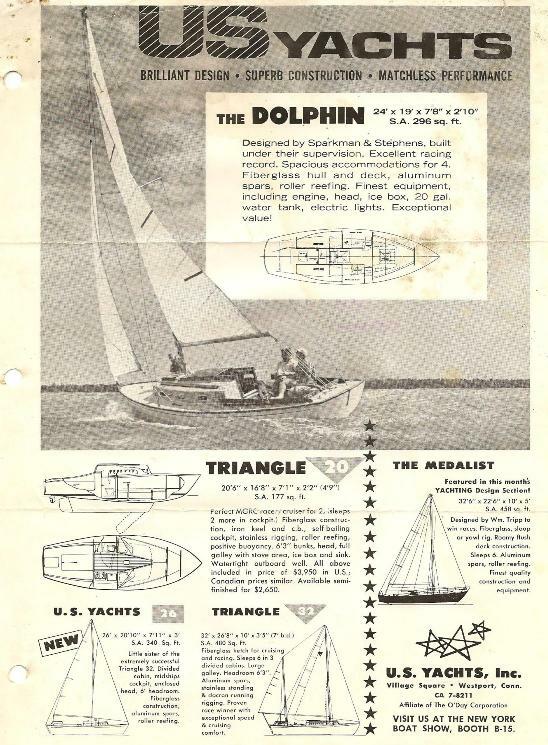 Perhaps, in part to address these problems, US Yachts was formed in late 1960 to market and distribute sailboats, initially representing O'Day in marketing and selling the Dolphin 24 , and later other companies' boats as well. Warren Dellenbach, an engineer, and also one of the original O'Day Investors, was significantly involved with addressing the start up problems that O'Day was experiencing in late 1960. Both Bob and Warren were involved with the mid 1960 decision to stop production of the Dolphin at the Marscot plant, and to contract Lunn Laminates of Port Washington, NY to build 25 Dolphins starting in early 1961. It seems that the Dolphin may have been too large and complicated a boat to be easily accomodated in the small 10,000 sq ft plant mostly producing small sailboats. The Lunn Dolphin had a revised fiberglass layup and a reputation of having a lower weight distribution profile than the Marscot built Dolphin. There is not one mention of Lunn Laminates in S&S's Dolphin 24 technical files - Surprising, given the change in construction reported and S&S's reputation for checking up on builders of their designs. This is a very interesting story, still being investigated. For more on this click here to go to Lunn Laminates. 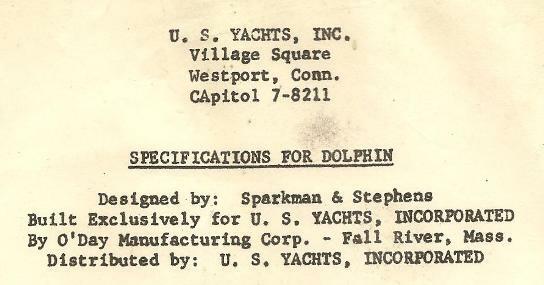 Paul Ingle (Seminole) provided us with some US Yacht literature on the Dolphin from his old files. 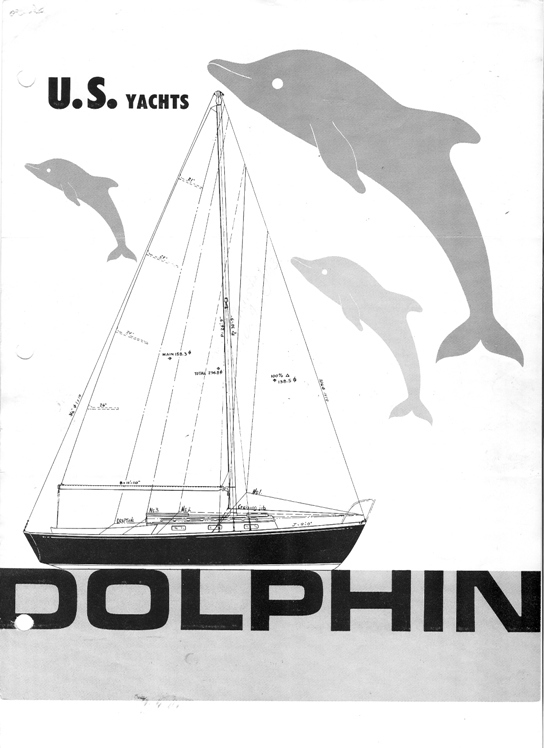 This is the front page of their Dolphin 24 flyer from January, 1962. This is the back of the 1962 flyer. July 30, 2009 The ad flyer below was found in a 'black book' that Peg Benkard got when she bought her boat, Sloop du Jour . While we don't know the date of the ad it was likely in late 1961 prior to the NY Boat Show. Note all the other boats, potentially competitive to the Dolphin, that US Yachts was selling - in addition to the Dolphin. It may be that Dolphin sales fell off significantly in 1962 -1965 in part because of this sales conflict, resulting in S&S urging O'Day to bring the sales and marketing function 'in house". 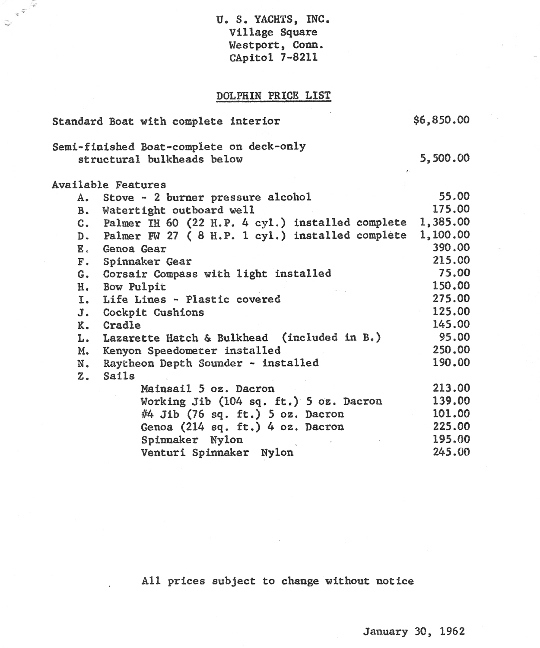 Above is the header for another 1962 US Yachts price sheet. The wording is indicative. Previously, US Yachts had been described as an affiliate, or as a division of O'Day. We will continue to try and find out more about the relationship between US Yachts, O'Day and Lunn Laminates. It was in the late 1950’s that Jim Bisiker’s construction company encountered troubledtimes. New jobs were scarce and those upon which he bid were awarded to his competitors who soon found that, by underbidding, they were on the path to bankruptcy. At this time, the use of fibreglass for the boat building industry was in its infancy. Dyer Yachts in Rhode Island were pioneering the techniques and building offshore powerboats in this new material. It was here that Jim, in company with Dirk Kneulman and John Burn, went to learn how to work with fibreglass. They paid Dyer Yachts for this privilege and came home with the required knowledge to begin boat building in Ontario. Grampian Marine Limited was born in the early sixties. The name came from the Grampian Mountains in Scotland where Jim Bisiker’s grandmother lived in Aberdeen. Jim’s construction company owned property on Woody Road in Oakville where a fibreglass plant was built in the back and the construction of Dyer designed boats begun under license. At first they made ten-foot sailing dinghies and small powerboats - the plant grew like topsy. There was a brief period when they imported and sold Sheerwater catamarans that were built by Fairey Marine in Hamble, England. Fairey was known for their building of Motor Torpedo Boats during WW 11. Then along came a group from the US wanting Grampian to build boats for them. They included Chuck Angel from Rochester, NY, who had designed the Triangle 20 and Triangle 32, a spacious centre cockpit cruising yacht, and later the US 42 which later became the 46. Marketing was done by US Yachts, whose principals included Bob Larsen (from the Time Life Magazine family) and Warren Dellenbaugh. Both Bob and Warren were from Connecticut, and were in turn also associated with the formation (in Fall River, Mass.) of O’Day Yachts, with George O’Day and the O’Day company president, Lyman Bullard. Thus Grampian commenced building not only the US Yachts line, but also (for the Canadian market only) the O’Day line of day-sailers. Also at this time O’Day was introducing the new Ray Hunt designed offshore powerboats and Grampian helped with some of the initial production and tooling, but chose not to continue into the full production phase. Jim says that these business relationships developed into very friendly and compatible meetings of the minds. The sixties were heady times in the boat building business. Mass production of fibreglass boats made sailing a sport that many could enjoy. Unlike to day, there were no used fibreglass boats for sale - everyone bought new. During the late-sixties, O’Day approached Grampian Marine with an offer to buy them but Jim Bisiker turned them down. However O’Day did purchase US Yachts and Triangle Marine and four months later, much to Jim’s chagrin, went public on the New York Stock Exchange. Grampian Marine continued to build boats for O’Day but they were not part of the NYSE Package.